Anyone with a hint of underboob cleavage will know the drill. 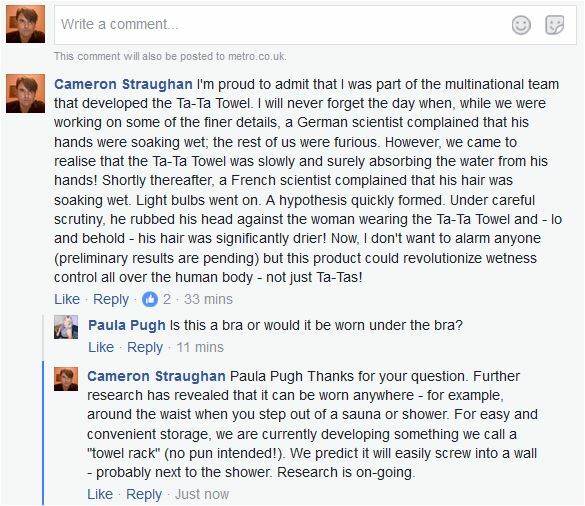 I’m proud to admit that I was part of the multinational team that developed the Ta-Ta Towel. I will never forget the day when, while we were working on some of the finer details, a German scientist complained that his hands were soaking wet; the rest of us were furious. However, we came to realise that the Ta-Ta Towel was slowly and surely absorbing the water from his hands! Shortly thereafter, a French scientist complained that his hair was soaking wet. Light bulbs went on. A hypothesis quickly formed. Under careful scrutiny, he rubbed his head against the woman wearing the Ta-Ta Towel and – lo and behold – his hair was significantly drier! Now, I don’t want to alarm anyone (preliminary results are pending) but this product could revolutionize wetness control all over the human body – not just Ta-Tas! Thanks for your question. Further research has revealed that it can be worn anywhere -for example, around the waist when you step out of a sauna or shower. For easy and convenient storage, we are currently developing something we call a “towel rack” (no pun intended!). We predict it will easily screw into a wall – probably next to the shower. Research is on-going.